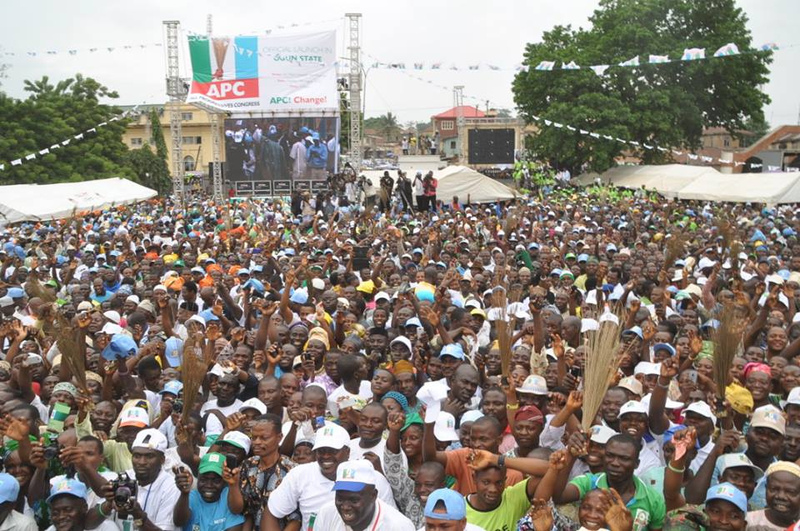 Following the words of the People's Democratic Party chieftain Bode George who called the All Progressives Congress an "experimental project" that will not stand the test of time, APC seems to be living up to the fears of majority of Nigerians who sealed their massive victory at the recently concluded electoral polls. 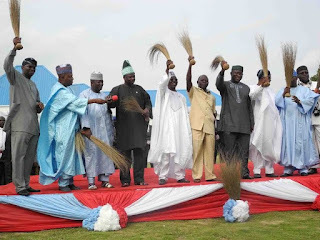 APC has become a test of how well the politicians from the South-West could mesh with their Northern counterparts. When I wrote my article on Nigerian Politics: Same Old Wine in a New Bottle, a lot of people frowned at it while some others joined my scope of thought. The fact that APC is made up of prominent angry politicians who broke out of the PDP due to personal ambitions that couldn't be guaranteed is a cause for alarm. APC is strongly regarded as the serum to revive the dying Nigerian state, but on the other hand, the party is struggling to form a cohesive political structure which is needed to champion the course of 'change' the people clamour for. Nigerians once again are set to return to the historical apathy we are used to. The system where no man or qualified voter is interested in the proceedings of the government due to the trend of failed promises that is associated with Nigerian leaders. Remember ex-President Goodluck Jonathan's claim that he would fix the Nigeria power crisis in 2011 when he won the election. He went further to claim that any government incapable of resolving the crisis in four years will NEVER fix it. After spending a whooping sum of N550 billion on the project. He only secured more darkness for Nigerians. This is just one of the failed promises we are used to which has caused a huge set back to the development of democracy in Nigeria. APC is still very young as the ruling party and majority of their activities have been marred with internal crises owing to nefarious personal ambitions of 'political investors' who saw the 'change' as an avenue to do business. This is evident in the level at which APC has turned majority of their campaign promises to mere rumours propagated by the mass media and social media. This ranges from Buhari claiming to conquer Boko haram within a time frame of 2 months to reuniting the kidnapped Chibok girls with their parents after being abducted by the members of the Boko haram sect for over a year now, equating the Naira with the Dollar which many thought wouldn't be economically viable and then reducing the price of petrol to N40 per litre. What about the issue of the failure of Buhari and Osinbajo to publicly declare their assets after Buhari promised in February, 2015 of a public declaration immediately he assumes power for the purpose of accountability? These were exciting promises that got the common men leaping for joy but after Buhari's victory. The first interview he granted to BBC on the 2nd of April, 2015 shockingly showed those promises couldn't be guaranteed. He went further to claim Nigerians shouldn't expect magic from him. This almost took us back to the painful memories of the military regime in Nigeria where rulership by decrees was the order of the day. Now here is the question, would Buhari have defeated Jonathan with the bluntness he is displaying now? Was this the major reason why he didn't show up at the organized presidential debate prior to the election? A friend told me something quite tricky which is that Nigerians never voted for Buhari. They only voted AGAINST Jonathan. That usage of pun seems meaningless like the famous inaugural speech of Buhari saying ''I am for everybody and I am for nobody" which has become the latest joke in town. A close examination of the statement speaks volume of a lot. For Nigerians to forgive Buhari's dictatorial past and opt for him to occupy a rigorous and demanding position like that of the President at the age of 72, it means Jonathan FAILED! Now how are we sure APC is not a cloned PDP? Governor Rauf Aregbesola is leading the course indirectly that things are still the same by owing his state workers a staggering 7-month salary which recently led to the death of a civil servant at his duty post with another man attempting suicide out of the frustration of not being able to cater for his family. PDP in Osun state has now mocked the APC led regime to call the National Emergency Management Agency (NEMA) to come distribute food materials to civil servants in Osun just as if they are crisis or war victims. That's a deplorable state. My first indication came from Raymond Dokpesi's brawl with Buhari over the defamatory documentary aired by the African Independent Television (AIT) to cripple his presidential ambition. Buhari decided to take his pound of flesh by banning AIT from covering any presidential activities which is totally not acceptable in a civilian dispensation. The publicity Secretary of APC immediately went behind Buhari to refute that claim stressing that he doesn't have the right to do so. Yes, that seems correct but I feel the inability of him not to speak in one voice with the president shows a loophole or lack of communication which will further be revealed at the later part of this article. This is an aberration to the stand of PDP's Publicity Secretary Olisa Metuh who spoke against Buhari's decision solely as a mouthpiece of the party. APC has been rocked by the problems of zoning and a bribe allegation of $500, 000 was said to have exchanged hands right inside the party that abhors corruption. Politics in Nigeria is just like filmmaking or a theatre performance that deals with make-belief system with the masses at the receiving end. The politicians are the actors while we are merely the audience. They make us know what they want us to believe and the tricks are perfected at the back stage which we don't have an access to see. According to several news media reports from the 23rd of April, 2015, there were fears that the All Progressives Congress would face internal divisions arising from the sharing of political offices as the geopolitical zones want the best slot. This called for the intervention of President Muhammadu Buhari to avert an imminent crisis that could cripple the party. This premonition unavoidable shook the foundation of the party later on. This is what happens when individuals representing several constituencies and states are seeking returns on 'political investments'. APC failed to agree on the zoning of political offices among the six geopolitical zones of the country. While the race for the principal officers of the National Assembly became intense, intensive lobbying and political alignment of forces became the order of the day. The party's failure to reach a consensus on the candidates and zones to produce the leadership of the National Assembly raised the fears that there might be a repeat of the 2011 incident that threw up Speaker Aminu Tambuwal and Deputy Speaker, Emeka Ihedioha against the ruling People’s Democratic Party (PDP) zoning. 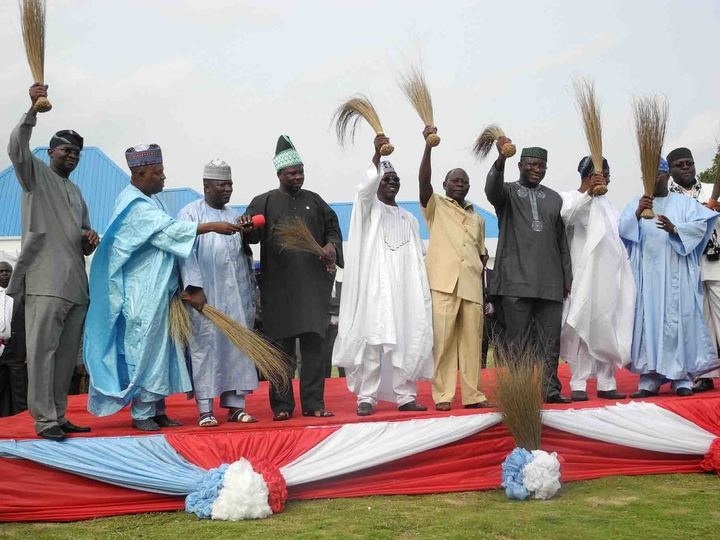 The political development in the APC ahead of the inauguration of the new government was a source of concern to the leadership and fears were being expressed by stakeholders that the situation if not handled properly may cause internal divisions in the party and discontent in the regions affected. This later happened with the proclaimed 'democratic coup' by Senator Bukola Saraki. Team A was for Bukola Saraki while Team B was for Ahmed Lawan. (Ekiti), Dr. Rahman Mimiko (Ondo) and Nyesom Wike (Rivers). Solomon Olamilekan, Kabiru Marafa, Fatai Buhari, Mrs. Monsurat Sunmonu, Soji Akanbi, Bala Na’Allah, Umaru Kurfi, and Mustapha Sani. In summary, this created a house divided against itself with the resultant effect of crumbling. with the Secretary to the Government of the Federation (SGF). Several internal interferences have affected Buhari's delayed release of his highly anticipated ministerial list till date. Intense competition also went in the Speakership position of the House of Representatives where APC's popular choice Femi Gbajabiamila lost to the party's Yakubu Dogara. Former Governor of Lagos state, Bola Ahmed Tinubu has been at loggerheads with the newly elected Senate President, Bukola Saraki over his controversial emergence. His wife, Senator Oluremi Tinubu reported refused to shake hands with Senator Bukola Saraki which is a sign of a cold war brewing up. This she did in alignment with her husband who hand-picked Ahmed Lawan for the seat of the Senate President of the 8th assembly. Bola Tinubu also went as far as accusing Buhari of betrayal over the way he took a neutral position on the Senate Presidency race. Buhari's northern advisers have been wary of the massive influence of Bola Tinubu in the party and cutting him down to size has been suggested. Former Vice President Atiku Abubakar quietly supported Saraki to spite Tinubu over the role he played in his loss at the APC's presidential primaries. Saraki has been reportedly accused of collaborating with an opposition party, PDP to win the Senate Presidency race which is treacherous. PDP on the other hand has offered to welcome Saraki back with open arms in the cause of a possible defection back to the party. These are series of power plays within the party which has eaten deep into the unity of the political structure. This will certainly hamper their performance in Nigeria. APC National Chairman Odigie Oyegun also joined the power tussle before he earlier accepted last week to deal with the issue as a 'family matter'. This amounts to the second time Lai Mohammed is undermining the power of Buhari after the AIT ban. 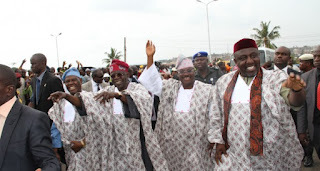 Is Tinubu really superior to Buhari as far as Nigeria is concerned? This is just one of the series of careless statements made by our leaders for selfish interests especially when they are aggrieved. (retd. ); Permanent Secretary, Ministry of Defence, Ismail Aliyu; Chief of Defence Staff, Air Chief Marshal Alex Badeh; and Chief of Naval Staff, Vice Admiral Usman Jibrin attended the meeting held inside the Defence House in Abuja. the Vice President should be part of these inaugural security briefings because he is the second in command and will deputize for the President in his absence. Osinbajo was also dealt a huge blow by Saraki who shunned a truce meeting organized by him with the claim that him, Bukola Saraki an ex-Governor of a state will not honour an invitation by a mere ''former commissioner''. This shows the high level of rivalry which has put the party in shambles. Furthermore, the long term strong relationship between Senator Ali Ndume who spearheaded Saraki's campaign in the northern part of Nigeria and Senate President Bukola Saraki will be perpetually strained as a result of Saraki using him as a sacrificial lamb to secure the support of PDP is his Senate Presidency race. He was forced to abruptly drop Ndume who was slated to become the Deputy Senate President at the emergence of Saraki. After Saraki's victory, Ike Ekweremadu of the PDP was nominated for delivering bloc votes of the Senators-elect from the Southeast in collaboration with Senator Andy Uba. In conclusion, APC officially has a porous structure which can be capitalized on by the opposition party PDP to cause mayhem. What is the fate of APC? Can these aggrieved groups ever bury the hatchet and move on to developmental issues in the country? Certainly there will always be a cold war with opposing parties patiently waiting for a golden chance to take back their pound of flesh. The village Town Crier will always be patiently watching. I feel for the fate of Nigeria as a whole. If these so-called leaders can't organize a unified party towards positivity, then how they be expected to prompt a positive change in a country of about 170 million people?